Cruz was publicly reprimanded by fellow Republican John McCain, but the hardline conservative remained unrepentant. The Texas Republican Ted Cruz may have racked up one of the longest performances in the US Senate, but his 21-hour speech exposed as much about the fault lines in the Republican party as it achieved its stated objective of stirring up opposition to Barack Obama’s signature health reforms. Within minutes of sitting down in the Senate to applause from conservative hardliners, Cruz received a public lecture from his fellow Republican, former presidential candidate John McCain, on the need to respect legislation that has been passed in a democratic manner. 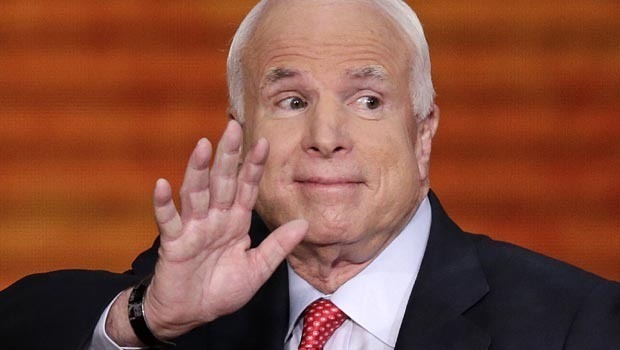 “I won’t take too much time – the floor here has been well used over the last day or so,” quipped McCain before the GOP grandee reminded the first-term senator of the struggle put up by Republicans to block the passage of Obama’s healthcare reform in 2009. “We fought as hard as we could, in a fair and honest manner, and we lost. And we lost, one of the reasons is because we were in the minority. And, in democracies, almost always, the majority governs and passes legislation,” he added. McCain also chastised Cruz for comparing the battle against Obamacare to the second world war, which he said did “a great disservice” to Americans who fought against the Nazis. 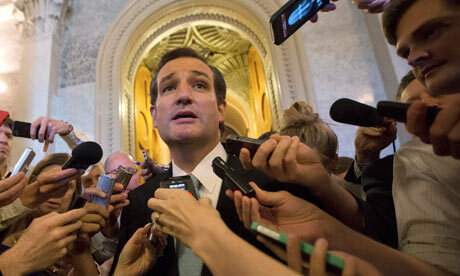 None of which bothered Cruz who has made a virtue out of bucking against the GOP old guard. When he took the floor of the senate at 2:40pm ET on Tuesday, he knew there was no chance of blocking the passage of what is known as a continuing resolution: a motion to maintain funding for the federal government. The resolution passed the House of Representatives on Friday, but is the subject of controversy because Republicans tacked on a provision that would defund the non-mandatory elements of the Affordable Care Act. Cruz had already negotiated his time on the floor with Senate majority leader Harry Reid, who permitted the speech as long as it fell within the time already allotted for debate on the continuing resolution. There was never a chance that the resolution would be delayed: Cruz always knew that he would have to give way to a procedural vote on Wednesday. Indeed, after sitting down, he joined every other senator in allowing debate on the resolution to continue. But Cruz never intended to be a slave to logic. He knew that the details would be lost on the general public: all they would hear was his anti-Obamacare message. Cruz even read a “bedtime story” to his daughters from the Dr Seuss children’s classic Green Eggs and Ham, whose central message is that people will like something that appears unpalatable when they try it. Cruz was much more attuned to another message, that he came across as a loving, hardworking father. Senior Republicans in the Senate could barely disguise their irritation at Cruz, who hit back in a retaliatory interview with the conservative radio host Rush Limbaugh on Wednesday. “The single biggest surprise about arriving to the Senate is the defeatist attitude here,” Cruz said in the interview, quoted by the Huffington Post. He accused his fellow Republicans of being “beaten down” and “scared of this fight”. Senate Republican leaders Mitch McConnell and John Cornyn had urged the members of their conference not to risk a government shutdown in a futile bid to overturn Obamacare. They stood on the sidelines as Cruz was joined on the floor by a clutch of conservative senators likely to become frontrunners for 2016 Republican presidential nomination, including Marco Rubio and Rand Paul.